Women today can be seen riding on bikes in their leather motorcycle jackets now more than ever. Realising this, manufacturers have started to manufacture a wider selection for women than the men's helmets. However, here are some things you want to know about women's motorcycle helmets in order to stay stylish while keeping all the safety measures intact, before purchasing them. HOW MANY TYPES OF WOMEN'S MOTORCYCLE HELMETS ARE THERE? Before purchasing a helmet, make sure you know which helmet- type works best for you either a full face, modular, three-quarter or half/beanie. The style of helmet is your choice. HOW DO YOU PROPERLY SIZE AND FIT A HELMET? The secret is to always try the helmet on before purchasing it. The ideal helmet should rest just above the brow-line, resting closely against the forehead with no room left to fit a finger. ARE THEY SIZED DIFFERENTLY THAN MEN'S HELMETS? 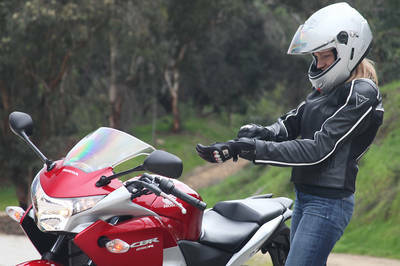 Yes, women's motorcycle helmets run the range of sizes from "double extra small" to "double extra large. Many colours and themes are available for women with colours such as various shades of red, purple and pink and including snazzy designs including flames, roses and completely custom artwork which you can order. ARE ALL HELMETS CERTIFIED TO BE SAFE? All helmets sold must pass inspection to be legal and to meet safety requirements. New helmets nowadays can protect the face of the riders from forceful wind, blasts, debris and bugs. The helmet also protects the ears from wind noise. Today, helmets for motorcycle riders are usually made from fiber-glass, carbon fibre or Kevlar and polycarbonate plastic. The structure of the helmets allows the shell compress on impact. When the helmet compresses during an impact, it instantly disperse the force throughout the helmet and reduce the pressure on the head. It is mandatory by law to wear a helmet. Safety is the main goal in the choosing of a motorcycle helmet. There are many colours, shapes and styles to pick from which will influence a buying decision. It's great to find a helmet that looks really good and suits your temperament but keep as the highest priority the quality and effectiveness of the helmet as a safety device. Sign up for our weekly newsletter. Featuring our latest articles and news from Bikes4sa.